MOSCOW, March 19. /TASS/. 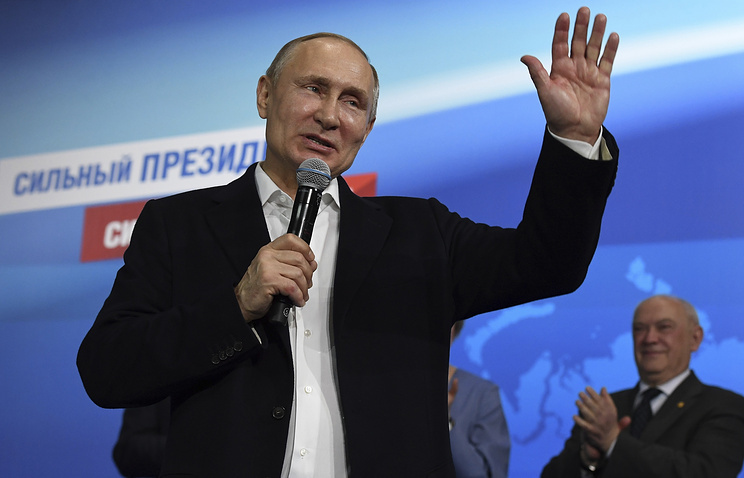 Leaders of nations from the Commonwealth of Independent States (CIS) continue to extend their congratulations to Russian President Vladimir Putin who won a landslide victory in Sunday’s presidential election. A strong Russia is something not only needed by Russians, it is a guarantor of stability and traditional values for the whole world, Moldova’s President Igor Dodon wrote in his congratulatory message. "As the president of the independent Republic of Moldova, I want to say for sure, a strong Russia is essential not just for Russians. Today’s Russia led by Vladimir Putin has become a symbol of hope for all peoples favoring stability in all regions, for sovereign internal and foreign policy, and for traditional values," the message reads. Dodon also noted Putin’s personal contribution to consolidating ties between the two countries. For his part, Armenian leader Serzh Sargsyan stressed in his message of greetings that "Russia and Armenia are linked by a time-tested friendship between the two fraternal peoples." "Thanks to the top-level political dialogue, foreign policy coordination, fruitful security cooperation and the joint implementation of mutually advantageous projects in trade, economics, humanitarian and other areas, the alliance between our two countries has strengthened even further over the past few years." Meanwhile, Tajikistan’s President Emomali Rahmon told Putin that his re-election is "a clear indication of solid support by Russian society of your policy aimed at modernizing, ensuring sustainable development and guaranteed security of cordial Russia, and strengthening its credibility in the international arena." He wished Putin good health, happiness and success during his tenure, and peace and prosperity for the Russian people. Uzbek President Shavkat Mirziyoyev noted in his congratulatory message that his state visit to Russia and intense bilateral dialogue at all levels have considerably boosted bilateral allied relations based on a strategic partnership. "The specific results of active cooperation at various levels in many areas including political, trade, economic, investment, banking and financial, transport and communications, military and technical, cultural, humanitarian spheres attest to that," he stressed. Russia’s incumbent head of state Vladimir Putin garnered 76.66% of the vote in the March 18 election with 99.84% of the ballots counted, the Central Election Commission said.